Themes Architectural and Community Development. basement head room 8ft. 3 fireplaces. House is unusual shape. Porch goes nearly around entire house. Careful, detailed and ornate woodwork on exterior. EastLake detailing like house on Florence Street, with same type oval-glass in door. June 1990 Andover Preservation Award for Exterior Preservation. 1830, February 24. Will of Solomon Holt 1, gives to son Solomon 2, the farm at 111 Reservation Rd. being the same property conveyed to him by his father Joshua. Grandsons Solomon 3, and E. Francis Holt, each (one undivided half) [book 604 leaf 645 Salem Registry of Deeds] E. Francis Holt’s wife is Parthinia. The land of this property was once part of the Solomon Holt farm and comprised all the land which is now the AVIS West Parish Meadow Reservation, the West Parish Church grounds and the cemetery. In May 1880 this lot of 2 acres and 2 sq. rods was purchased from Solomon & E. Francis Holt by Dr. Charles A. and wife Lizzie for $350. 1880, July 23 Andover Advertiser – "Dr. Charles A. Holt and family are boarding with E. Francis Holt in the West Parish." 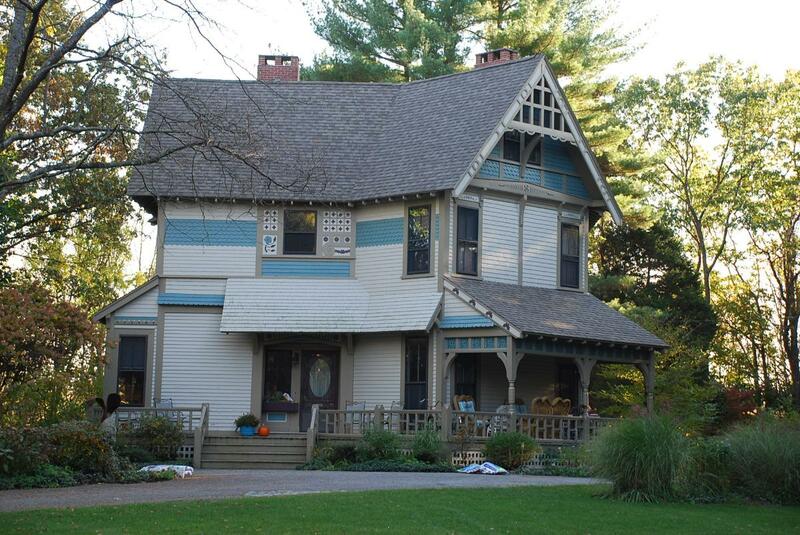 Dr. Charles Holt built the Eastlake stick style Victorian house at this time. In March 1882 the house was sold to George & Martha Blake of Belmont, MA. Dr. Holt held the mortgage. The Blakes remained here until July 1895 selling to John A. & Ella S. Morrill. Morill held the property 8 years then sold to Edith E. Hardy. On October 8,1908 Edith E. & Frank Hardy purchased the property which was conveyed on November 11, 1908. The Hardys were members of West Parish Church and Frank Hardy was the owner of the Hardy Brush Co., his factory in the barn behind the stone house at 183 Lowell St. With the expansion of the West Parish Cemetery in 1908-1910 by William M. Wood, president of the American Woolen Co., Wood's design necessitated removing three buildings on Lowell St to create the new entrance and green. One was the new home of Frank Hardy and others the Andover Grange Hall and the church vestry. The Hardys sold their property to Wood and their house was moved to 129 Lowell St. Hardy then sold some of the land at 202 Shawsheen Rd. to the west to the church for the use of horse sheds. The Grange Hall was relocated to 210 Shawsheen Rd.and the vestry next to the church. Carl E. & Rita Holch bought the property on July 26, 1946 and remained for 12 years selling on June 12,1958 to Frank & Marcia M. Michel. The Michel family lived here until 1969 selling to Waren H. Arthur on Sept. 9, 1969, Waren and wife Priscilla lived her until Sept. 2, 1977 when they sold to E. Thomas & Sandra F. Carothers. The Corothers sub-divided the property creating a new house lot next door to the west at #206. 1990 - Irvin W. Weaver. 1830, February 24. Will of Solomon Holt 1, gives to son Solomon 2, the farm at 111 Reservation Rd. being the same property conveyed to him by his father Joshua. Grandsons Solomon 3, and E. Francis Holt, each (one undivided half) [book 604 leaf 645 Salem Registry of Deeds] E. Francis Holt’s wife is Parthinia. 1882, March 21, George F. & Martha Blake of Belmont, MA for $3500 land with buildings on, from Charles A. Holt & Lizzie. Bk. 67 pg. 440) Must insure property for the full amount as Holt held mortgage.